'A garden without water', someone once said, 'is like eating an egg without salt'. The fish pond - a pond for the benefit of fishes. The wildlife pond - for the benefit of creatures other than fish. The water feature - for the benefit of mosquitoes. The formal garden pond does not try to re-create nature on a small scale. This fact allows you much more freedom of imagination when it comes to designing your pond.You can have any geometric shape you wish. You can have one square pond emptying into a rectangular one.You can have fountains, water falls or whatever takes your fancy. The beauty of the formal pond is that you are not trying to copy anything. It is also easier to hide pumps, filters and lighting within a formal pond. 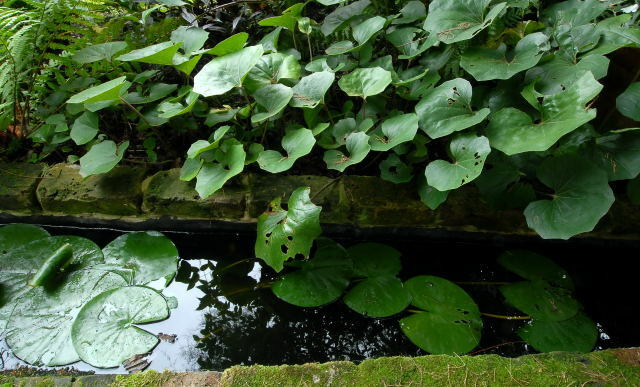 The natural garden pond, as the name implies, tries to look as if it were a naturally occurring water hole.This generally results in a pond of an irregular shape, more often than not kidney shaped.The biggest challenge with a natural pond is to add moving water. Fountains or miniature waterfalls rarely look natural. Having decided on your garden ponds style, the next decision is how to construct it. Superficially the pond liner seems the easiest option.You simply dig a hole to the shape of your choosing, line it with sand ora pond-liner underlay, lay the pond liner on top and fill it with water. In reality it is very difficult to get a neat finish with pond liners.There will always be creases and folds, although many of the ponds inhabitants rather like this. Folds and creases are particularly obvious at the surface and especially if you build a rectangular pool.This can be disguised somewhat by whatever you have chosen to edge the pool, but inevitably will be visible from at least one angle.In time you will not be able to see any under water creases due to plants etc.So if you would find all this irritating it is best to use a pre-formed pool. Pond liners are a good choice when you want complete control of the shape, for example with a natural pond. There are different grades of pond liner. What you are paying for is strength and longevity. If you don't like the thought of having to empty and re-line your pond every ten years or so, buy the most expensive butyl liner. Pre-formed ponds come in a large range of shapes and sizes.So long as you are not too fussy you should be able to find a shape to suit your requirements. Pre-formed garden ponds are pretty straight forwardto install, particularly if you are dealing with a symmetrical shape. One advantage of the pre-formed pond over the pond liner is the ability to attach pipes (if you so desire) through the sides of the pond. The main problem with concrete ponds is their inability to flex. Extreme conditions of wet or drought can cause the soil to shrink or swell.This can result inhair line cracks occurring within the pond. Although repairing the cracks is not that difficult, locating a crack on an algae covered surface can be a long and tedious job. Just because you find and repair one crack does not necessarily mean you have found them all. Concrete ponds are probably best avoided.